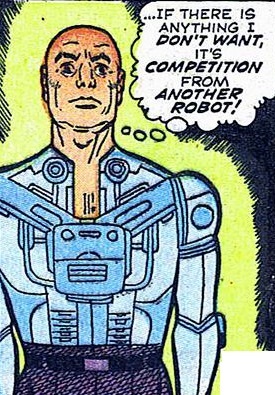 Aliases: "Titan of the automobile industry"
Powers/Abilities: Although appearing to be a man, Luther Worthington was actually a sentient machine built in human form. He was capable of independent thought, and presumably he had business administrative skills, but he displayed no other unusual abilities. 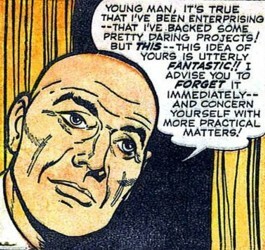 (World of Fantasy#18/3 (fb) - BTS) - Luther Worthington's past is largely unrevealed, but at some point he was built by unspecified parties. With his true nature apparently a secret, Worthington became the president of Titanic Motors, where he used his skills to help the company become one of the largest automobile manufacturers in the world. 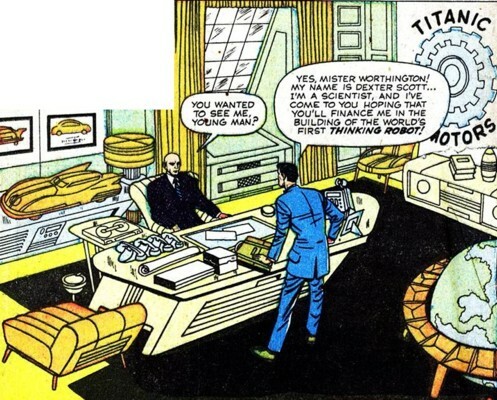 (World of Fantasy#18/3) - One day in his office, Worthington received a visit from Dexter Scott--the young scientist was hoping that Worthington would finance his project for building the world's first thinking robot. 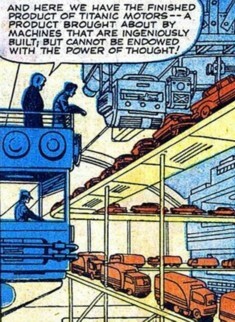 In an attempt to dispel the young man's foolish notions, Worthington took Scott on a tour of his factory's automated assembly line; he pointed out that all the machines had to be supervised by human operators, and although they were ingeniously built, the machines could not be endowed with the power of thought. 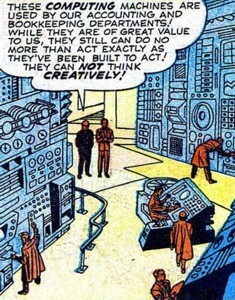 Worthington next took Scott to the computing machines used by the factory's accounting and bookkeeping departments; he told the scientist that machines could only act as they had been built to function, and they did not have the capacity to think creatively. 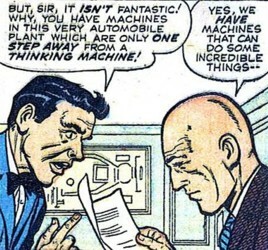 The two returned to Worthington's office; having demonstrated the limitations of machines, Worthington hoped that Scott had seen the folly of his plans for building a thinking robot and would abandon the absurd idea. 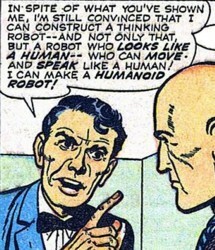 But in spite of all that Worthington had shown him, Scott told him he was still convinced that not only could he construct a thinking robot, but he could also make it look and act like a human being! With his patience at an end, Worthington ordered Scott to immediately leave his office, and he advised the young scientist to keep his ludicrous ideas to himself, or he might find himself the object of ridicule. As the dejected scientist left his office, Worthington almost felt sorry for him, because he knew no one else would help in financing his incredible project, for wealthy men were not that foolish. 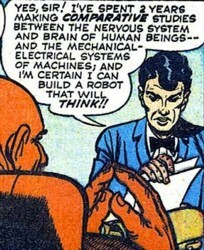 As he stood alone in his office, Luther Worthington removed his jacket and shirt, and he felt a sense of relief because Dexter Scott could have spoiled everything--for years, Worthington had tried to discourage any experimentation in the creation of thinking robots, because if there was anything he didn't want, it was competition from another robot! Comments: Created by an unidentified writer and Jack Kirby (artist). Considering his surname, perhaps Luther Worthington had some connection with the wealthy Worthington family (see clarifications). Or maybe there's some big secret conspiracy going on, and the builders of Worthington also built Delphine Courtney of Roxxon Oil (Think about it... Cars... Oil... It all ties together!). A spacious office in the administration building of the Titanic Motors factory complex, it was where company president Luther Worthington ran the operation. One day, Worthington received a visit from scientist Dexter Scott, who was seeking funding for an unusual project. A multi-building facility located in an unidentified American city; under the management of company president Luther Worthington, it was one of the world's largest automobile manufacturers. 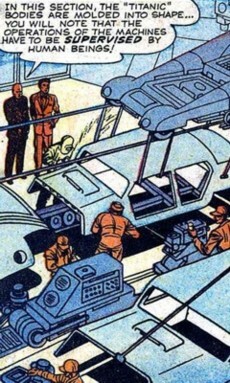 Worthington took scientist Dexter Scott on a tour of his factory's automated assembly line, all in an effort to demonstrate the limitations of machines and to dispel Scott's notion that he could build a thinking robot. A young scientist, Scott had spent two years making comparative studies between the nervous systems and brains of human beings, and the electro-mechanical systems of machines--with this knowledge, he was certain he could build a robot that could think. In an effort to seek funding for his project, Scott went to the office of Titanic Motors president Luther Worthington and told him of his plan. 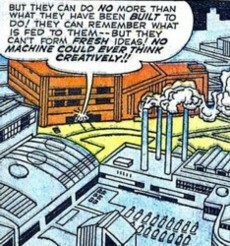 But Worthington only tried to discourage Scott by taking him on a tour of the assembly line of his factory, and showed Scott that machines didn't have the capacity for independent thought or creativity. Nevertheless, Scott told Worthington that he was still convinced he could build a thinking robot, and he could even make it look, speak, and move like a human! 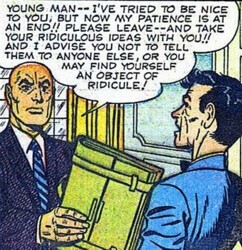 Having lost his patience, Worthington ordered Scott to leave his office, and the dejected scientist complied. Unknown to Scott, Luther Worthington himself was actually a robot!